Leeds, UK – the birthplace of funk? Not quite, but the home town of the rising funk-jazz phenomenon, The New Mastersounds. 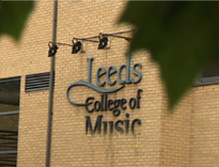 By offering the first Jazz degree in Europe, Leeds College of Music attracted scores of talented musicians to this Northern former industrial hub to master forms of music that had been seeping in on vinyl carried by cargo ships from across the Atlantic for decades. A thriving live music scene soon developed in Leeds, and many of these young musicians embraced American funk and soul from the 60’s and 70’s. birthplace of funk, for 3 performances that coincide with the 2007 New Orleans Jazz and Heritage Festival. Unsure about bringing sand to the beach (or ”Coals to Newcastle” as they say in Britain), The New Mastersounds try bringing their brand of funk to New Orleans. With sit-ins and commentary from several New Orleans master musicians, “Coals to Newcastle,” offers viewers a look into the lives of 5 Britons that have been influenced by a uniquely American art form, and a glimpse at the city that started it all as it struggles to retain its culture after Katrina’s devastation.